Several years ago, a friend of mine came up with the realization that we were spending lots of money buying fresh produce for our families. We live in Texas and don’t have Aldi. My friend decided to see if we could save money by buying fruits and veggies by the case and splitting them among several families. Our co-op was born out of this idea and it’s been 3 ½ years of great savings. 1. Contact the Produce Manager (in person) at your favorite grocery store. Tell him or her that you know 15 to 20 families who are are interested in regularly purchasing about $300 to $450 of produce each week. Say that you’d like to work with him or her to come up with a volume discount for making a consistent large purchase. Like the rest of us, Produce Managers are responsible for their productivity and sales, so knowing that they can boost their weekly numbers by several hundred dollars should be appealing to them. Now, you can’t go in and ask for a unilateral 20% discount, but you can try to get a good deal for you and your friends. Generally, my store gives me a 15-20% discount on my entire purchase. Sometimes, though, the savings are much more. 2. Come up with a cost per family to participate and spread the word. In our co-op, we have “Shares.” Single Shares are $15 and Double Shares are $28. I give a Double Share a discount because they often are easier to sort. I tell people that a veggie-loving family of four to six will eat through a double share in less than a week. Smaller families or those trying out our co-op opt for the Single Shares. Once you have your cost, then you start telling everyone you know about what you’re trying to do and get their commitment to try it. For our group, we do not place an order with less than 18 shares. In my experience, my Produce Manager is more generous with the discounts when I’m spending over $350. The last time I calculated, a $15 Single Share at market value was about $23. (I checked the price of produce at the store I bought my cases and Walmart.) That savings is bigger with a Double Share. In that instance, you’re getting about $46 worth of produce for $28. 3. Find out what fruits and veggies your friends like and loathe. People won’t order each week if you buy strange things. At first, we got cauliflower every week and quickly found out that people didn’t like it that much. Now I get it every few months. If you’re a spreadsheet person, make one. I just write it down in my notebook. We tend to get the basics. Each week I order romaine, loose carrots, bananas and apples. These generally are well below market value prices, so I always get them. Then, we add items like broccoli crowns, green beans, potatoes, onions, cucumbers, zucchini, summer squash, corn, tomatoes, cauliflower, sweet potatoes, asparagus, avocados, celery, oranges, pears, peaches, nectarines, kiwi, mangoes, strawberries and grapes — “normal” foods. While I may like artichokes, I don’t assume everyone else does, so I try to stick with mainstream fruits and veggies. I also buy seasonal fruit and vegetables because the prices are even lower. 4. Research case quantities and weights. 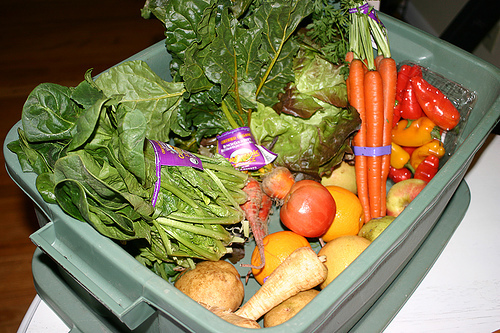 Ask your Produce Manager how many items or pounds are in cases of the things you are considering. For me, romaine comes in cases of 18, carrots are 25-pound bags, strawberries in flats of eight and apples are in 40-pound cases. These are important things to know, so that you know how many cases you’ll need to purchase in order to meet the needs of your group. 5. Prepare an order based on how much money you have. When I’m ready to place my order I have written down how many Single and Double Shares I have and how much money I have to spend. I come up with the list of items I’d like to buy and write down the pre-arranged prices for certain items and my “hopeful” prices. I call my Produce Manager and we work through my list. Sometimes we negotiate. Other times I’m told “This is the best price I can give you.” I take it or leave it, based on what I have to spend. I try to buy five to six different fruits and five to six different vegetables. I also keep track of each week’s order, so I don’t order the same items consecutively. I keep all my co-op information in a notebook. You can come up with a spreadsheet or print out a chart if you’d like. Notebook paper works for me. What does a Produce Day look like? On Produce Day, I go to the grocery store and pick up my produce. My husband takes the back seat out of our minivan so I can get it all in there. I meet up with the manager and we go over the order. It usually is sitting in the cooler on a cart for me. Once we double-check everything, I go to the check out to pay while a member of the produce department loads my van. We unload and begin to sort into laundry baskets. (Each co-op member is responsible to have two laundry baskets marked with their name to use for their co-op purchases. They pick up their full basket each week and drop off their empty basket from the previous week.) We determine how many items go in each basket based on how many shares we have. Many items have the actual case count printed on the end of the case, or the Produce Manager has told me how many items are in the case. Often, I end up with leftovers after evenly dividing everything. If I have 18 Single Shares and six Double Shares, and nine apples, the Double Shares get the first six, and the rest go into an “extra basket.” The extra basket gets the random carrots or whatever that doesn’t evenly divide. It’s first come, first served for people to take whatever they want from the extra basket. Also, my cantaloupe or asparagus-loathing folks can put theirs in the basket, and take a handful of whatever they want to make up for it. I have a 30-minute window for people to pick up their baskets. When they come, they bring their empty basket and sit it on my front porch, and then pick up their full basket. Often, they will also pay for the next week, so they only make one trip to my house. My total time investment is about two to four hours each week. The bulk of that is on produce pick-up day. It might take a bit more time upfront getting things organized, but once it’s running, your time investment is much less. What do I get out of running this co-op? First, I take a free Single Share of produce for every 10 Shares sold. I do purchase Shares to help us meet our 18-Share minimum, if necessary. However, usually two to four hours of work gets me $40-$50 in free produce for my family. Since I do all the work, folks in my co-op don’t mind me taking free produce. When calculating how many shares I have, I add my shares to the total, but don’t add the money. So I’m buying 30 shares of produce, with 28 shares of money. The co-op also gives my children a chance to practice their math skills while sorting. And it gives them a excellent opportunity to serve others by lugging cases of produce into the dining room, sorting hundreds of apples, opening the doors, playing with littles while mom visits and carrying baskets out to vehicles. While we know many people in our co-op, there are many others who have joined by word-of-mouth. That has given us a tremendous opportunity to minster to others. Deja Armstrong has been married for 16 years and is a homeschooling mom to 5. She spends about $400 per month on groceries. She’s values family and is about to launch a Titus 2 blog for women in her church. That sounds like a great program!! Being a working mom, I don’t think I would have time to be the co-op organizer, but if someone else in my area organized one I would definitely join!! Thanks for posting! Where are you in TX Deja? I’m in Denton and would like to join in your co-op. Our great state is huge so I won’t hold my breath but I figured I’d check! Love that you’re starting a Titus 2 blog btw, good job! @leann, I don’t know where they are from but isn’t Denton not too far from Lewisville? I know there is a Bountiful Baskets location in Lewisville. Over an hour for me so I haven’t bitten yet but think it looks great. I don’t know if I have enough people that would want to participate, but that’s a really interesting idea. Thanks for sharing! That’s awesome!! There’s just my and my boyfriend now, and I don’t think I could easily cook/eat all of that in a week very easily — mostly due to a lack of cooking skill and creativity. Something interesting to check out for later tho, for sure! I’d love to know where Deja is too. I’m in Houston and would love to join a co-op! I’m near Houston as well and have been searching for something like this! I’m also interested to find out where in TX your co-op operates. Although it’s probably a long shot that you’re near me..I’m in Frisco. I don’t know maybe I’m just a downer here but that seems like a lot of work for a very small discount. I also live in TX and I buy a ton of fresh fruits and veggies. I for the most part buy what is in season and on sale. For example, watermelons… if not on sale the medium sized ones can be $4-$5 but we buy when they are $1 each. Grapes can be $2/lb, we buy when $.90/lb or less (stock up when they are $.69/lb or less, my kids love frozen grapes as a treat on a hot day). @Rae, I dunno, according to her, her savings are $10-25/hour, which isn’t bad. And she’s helping friends and neighbors, so it’s probably worth it. This would also be a great idea for someone to organize for their church, and offer it to the families in the church neighborhood as well. It isn’t quite the same, but Azure Standard (azurestandard.com) is beginning delivery to North Texas in August. I believe there will be drop sites along I-35 from Denton to Waco. Those looking for something in that area might want to check them out! This is a great idea, but i am a full time working mom of 2. I’d definitely join a co op of in the Keller (Woodland springs subdivision) area. This is great info! I’ve always wondered the behind the scenes. Great info! And kuddos to you to sharing such a great program with your neighbors and us here! This is a very interesting article. I’m glad I got the chance to read it! 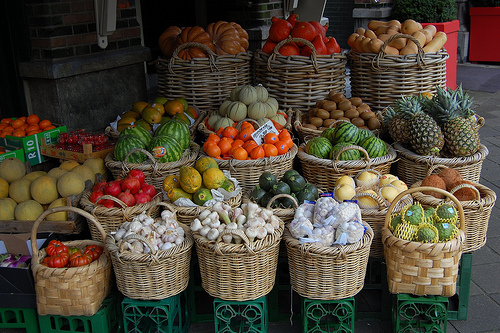 The more ethnic markets are great on prices of produce and fruit. I was just in Sunland Produce today to see if they had sour green plums (only store that I can find that sells them) and they did! Plus cherries for $2.99 a #. I’m interested in getting more local organic produce which is why I was looking at this. While Sunland Produce has great prices, almost none of it is organic. Trying to get my family away from all the pesticides our produce is sprayed with. Deb are you in the Valley too? I’m in the DFW metroplex, and I’m part of a co-op that does a similar thing, but at the Dallas Farmer’s Market. We get tons of produce at a price well below what we’d pay at the grocery store, sometimes local, sometimes organic. For something like this, you don’t really need a huge group – we find that 9-12 shares is a good amount, and each share is about 2 laundry baskets – good variety but more than 1 of most things. My sister and I share a share since neither of us can finish the whole thing before we get more. Also, the work involved is minimal – each person has to go do the shopping and sorting about once every 2-3 months, so the organizer is not always the one getting up at 5am on Saturday! I think this is a fantastic idea, but I would be so overwhelmed with the amount of work to run one! I’d jump on the chance to join a co-op if anyone in our area had one. Currently all our local co-ops that actually have good prices are full! Great article Deja! I am sure your family, friends and neighbors really appreciate all the hard work you put into this for them! That’s really interesting and informative! Thanks Deja! Though I live in Utah where Bountiful Baskets is based, I live too far away to take advantage of it. This is typical; there just isn’t much for my town so I’m quite tempted to try doing this! I definately would love this! I work fulltime 40+ hrs, and have 4 kids at home. Don’t think I could do this, but would LOVE to be part of one in Erlanger, Kentucky!! We have a great Urban farm that offers “market baskets” for about $16 a week. The baskets are meant to feed a family of four for a week. We’re a family of three and go through pretty much all the produce (except maybe for all the sweet potatoes we get in the winter) in a week. The farm not only grows and sells food but also teaches kids about urban farming! We love getting a great deal on food, but it’s also great to support a wonderful cause! Those of you who don’t have the time to organize your own co-op look around your communities, and talk to people you know who are into that kind of thing. You’d be surprised at what you’d find! Wow, what an informative and helpful post. Thanks! Thank you, Deja, for sharing this very great information! How do you figure out how much food a person gets for a single or double share? I would love to see her Titus 2 blog…is there any way you could email it to me, or post it on your website?? That sounds awesome! Also, does anyone know if there is a similar co-op in Greenville, SC? I am looking for fresh, cheap produce!! do they have anything like this in south carolina??? my cousin in utah just told me about bountiful baskets a few weeks ago and it sounds great! I live in Dry West Texas in a town of about 100,000, not a huge urban area. We have HEB, Albertsons, Lowe’s and Walmart. The way we figure out how to divide items between baskets is to first determine how many items are in a case. Most fruits have an actual count printed on the end of the cases. If not, my children practice their estimating and counting skills. So if I have a case of 88 Pink Lady Apples and 20 shares, each share receives 4 apples…the doubles get 8, and the extra 8 apples get divided among the double shares and any remainder after that goes in my ‘extra basket’ for people to pick from. One row of baskets is single shares and the other row is double. It makes sorting and counting easier on my kiddos to have them separate. HTH. This is an excellent blog post. I have never seen anything like it. I see Deja’s grocery budget more accurately reflects a family in Texas as opposed to other areas in the country whose grocery budgets fair less. Though my grocery budget is more than Deja’s my reading has found Texas grocery spending is higher. Hey, check out your state or local CSA/Community Supported Agriculture programs. In my town there are several farms where I can pay between $200-$400 per season & p/u fresh picked veggies up to 1-4x per month. 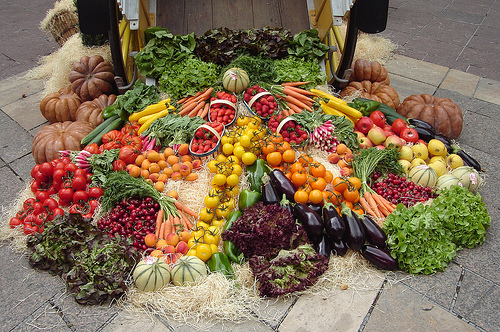 You get fresh bounty of organic veggies and support farms in your area. My neighbor and I split the cost of the every other wk option and it’s more than enough for our 2 families. This year we may venture into canning. We also have a Farmer’s Mkt every Saturday where anyone can buy fresh produce, organic eggs, beef, honey, cheese, artisan bread, flowers.